“Why is this tongue-in-cheek affair or play of hide and seek over Indian Prime Minister’s two-day official visit to Sri Lanka? This is the question one may ask oneself if one reads the two Indian national newspapers. The Hindu and Indian Express on May 12 noted the diplomatic game skillfully played by both Sri Lankan and India governments. It would then seem that both countries had something to hide about the agenda of the Indian Premier. One immediate reason is to avoid the black-flag demand by sections of the Joint Opposition in Parliament in Sri Lanka but there were far more important issues at stake like the demand/offer of the remaining oil storage tanks at Trincomalee and ECTA with India both of which caused national-scale issues in Sri Lanka, which had to be kept down. While The Hindu cautiously put the claimed religious reason within inverted commas, The Indian Express was bold enough to assert in its headlines “Modi in Sri Lanka: The MoU nobody is talking about during his visit.” It would then appear that both Sri Lankan leaders know what the Indian leader is coming for, primarily and that it is not primarily the avowed “religious” purpose. It is precisely the Sri Lankan people who are finally being taken for a long ride. Why this “Hide and Seek”? The Indian Express observed: “When a head of government goes abroad on an official visit, the countries involved are usually only too eager to reel off the number of agreements that will be signed. Even when there was a dialogue between India and Pakistan, however half-hearted, there was always the expectation of a joint statement or an agreement on some low hanging fruit, such as visas, never mind if it was belied each time. *A 500 MW LNG fired power plant, for which the Sri Lankan government will issue a letter of intent to India by “end May 2017”. *A 50 MW solar power plant in Sampur, near Trincomlaee for which Sri Lanka is to issue a letter of intent by “mid-May 2017”. *Joint development of the Upper Tank Farm containing 84 tanks in an area of 800 acres by Lanka IOC and Ceylon Petroleum Corporation for which the two will set up a joint venture by the “end July 2017” and make business development plans by September 2017. 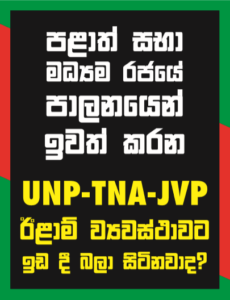 *A port, petroleum refinery and other industries in Trincomalee for which both governments will set up a joint working group by “end June 2017”. *Road and railway projects in Trincomalee, Mannar and Jaffna. In Sri Lanka, the government is being attacked for this MoU. Prime Minister Wickremesinghe spoke in Parliament defending it, pointed out that Lanka IOC had been paying USD 100,000 per annum since 2003 for a lease signed in that year for the tank farm. “None said no to the monies,” he said. The general impression in Sri Lanka is that there is nothing in the MoU that binds the country to anything with India. Among India’s objectives during the visit by Modi is to convey quietly but firmly that New Delhi is serious about implementing each of the projects, and expects Sri Lanka to reciprocate. According to media reports, Prime Minister Modi met President Sirisena on the very first night itself for bi-lateral talks and held discussions with Prime Minister Wickremesinghe as well. It is just as well to ask whether President Sirisena didn’t tell the country that the Indian leader was arriving on his invitation to participate in Vesak celebrations. The agenda has been filled since, making the religious celebrations a UN affair with 80 countries invited thereto. Modi’s visit to Dalada Maligawa can be considered part of protocol for visiting dignitaries, and the opening of the Indian built hospital at Dickoya can also be accepted as appropriate for the Indian leader to participate. Another interesting aspect about the Indian leader’s visit is that it took place two days before Prime Minister Wickremesinghe’s scheduled visit to China to participate in the “One Road: One Belt” forum with other plusses. Aren’t we now facing times of skullduggery in the politics of this country while India under Prime Minister Modi is practising soft diplomacy using Buddhism as across the border communicator in Asia? To sum up, one could summarise that the Indian leader is not coming just for some low hanging Sri Lankan fruit besides practicing his using Buddhismas a communicator.